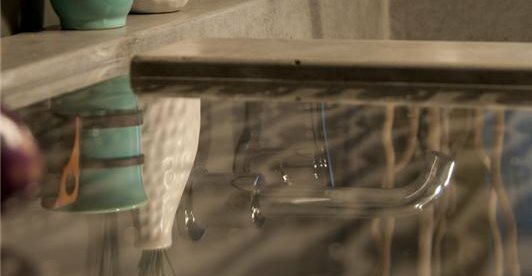 Stainless steel spoons, hammered flat by hand and artistically arranged beneath an inlay of glass, form a unique drainboard for this farmhouse-style concrete sink. A close-up of the drainboard. A custom-fabricated piece of perforated stainless steel serves as a drain cover. The entire sink is sealed with a satin-finish water-based penetrating sealer (from Buddy Rhodes Concrete Products. 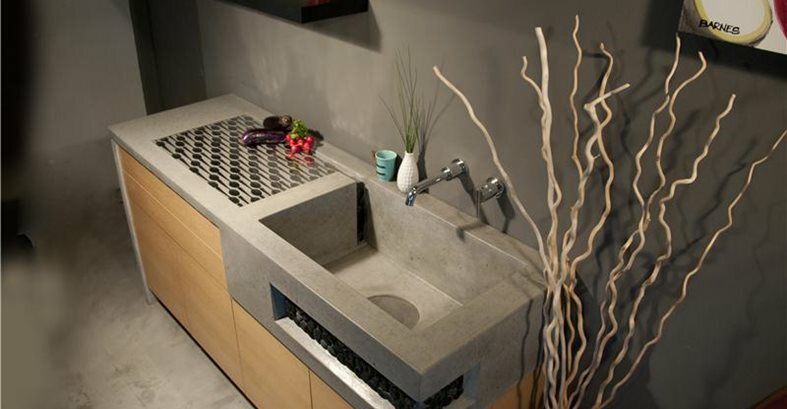 The challengeChris Frazer of DC Custom Concrete and partner Daryn Barnes specialize in custom concrete sinks, but for their latest project, they wanted to create something totally unique that hadn't been done before. That's when Barnes came up with the idea of using a common kitchen utensil to create an integral drainboard like no other. Design goals"Our objective was to create a farmhouse-style sink with a lot of character as well as functionality," says Frazer. "The drainboard is embedded with stainless spoons that were hand-hammered one by one. Then an entire piece of clear glass was inlayed over the top. The way Daryn assembled the hammered spoons made a unique display." The entire piece is about 6 feet wide and 2 feet deep. The sink itself is 17 x 30 inches at an 11-inch depth. A recess beneath the sink, accented by charcoal-gray decorative river rock, echoes the colors of the drainboard. To give the sink its rich gray color tones, Frazer and Barnes used a gray portland cement mix, brightened by a touch of white cement. The mix itself is a glass-fiber-reinforced concrete (GFRC) with a complex matrix of aggregates and fibers. "Our proprietary mix has a high PSI and a high tensile strength as well," says Frazer. The decorative river rock was set in a thin-set mortar after the concrete was cast. "We cast the recessed area deep enough to accommodate the thin-set and river rock and still have an 'inset' feel to it," says Frazer. 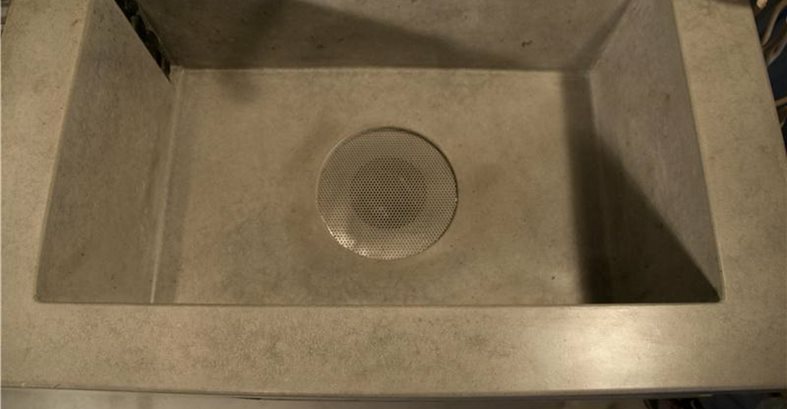 Another unique touch is a circular piece of perforated stainless steel that was inset over the drain of the sink after casting. "The steel will take the grunt work of the daily use a kitchen sink endures" says Frazer.